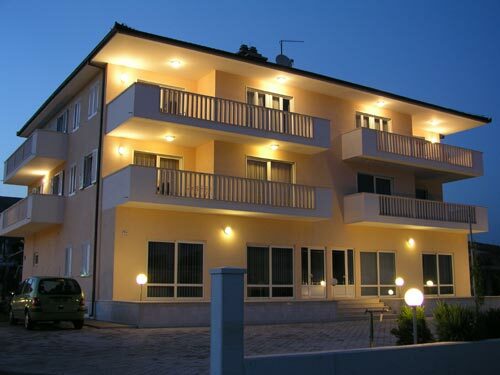 Recently built and exclusive appartements "Trogir" are situated on an excellent location in a quiet area of the western part of the city of Trogir (some 200 m from the city centre) and 50 m from the main road with an easy access. The appartements are on the first and second floor of the family house. 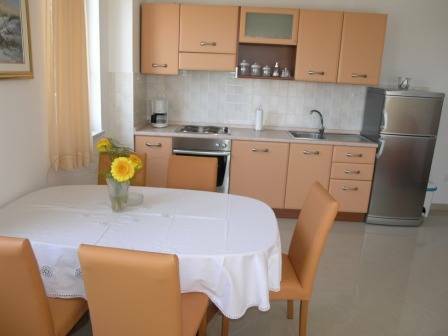 There are 7 appartements and a twin room, categorized with four stars. All together we can accommodate 24+12 persons. They occupy the area of 65 m2 + 12 m2 of the balcony. There are two double-bed rooms, a spacious living room with a kitchen (cooker, fridge, coffee machine, kettle ) and a sofa for two persons to sleep on, an armchair, a table and chairs, bathroom with toilet (hair drier, towels, shampoos, washing machine, etc.) air condition, SAT/TV, access to the Internet (wireless) and a telephone. They occupy the area of 65 m2 + 18 m2 of the balcony. They include one double-bed room, (matrimonial bed), one bedroom with two separate beds, a spacious living room with a large kitchen (cooker, fridge, coffee machin, kettle) and a sofa for two persons to sleep on, a table with chairs, bathroom with toilet (hair drier, towels, shampoos, washing machine, etc.) air condition, SAT/TV, access to the Internet (wireless) and a telephone. It occupies the area of 30 m2 + 6 m2 of the balcony. It includes a master bed, a sofa, a table and chairs, a kitchen (fridge, coffee machine, kettle), bathroom with a shower(hair drier, towels, shampoos), air condition, SAT/TV, access to the Internet (wireless) and a telephone. It occupies the area of 25 m2 + 12 m2 of the balcony. It includes a master bed, a sofa , a table with chairs, a kitchen (fridge, coffee machine, kettle), bathroom with a shower(hair drier, towels, shampoos), air condition, SAT/TV , access to the Internet (wireless) and a telephone. It occupies the area of 20 m2 + 6 m2 of the balcony. It includes a master bed, a table with chairs, a kitchen (fridge, coffee machine, kettle), bathroom with a shower(hair drier, towels, shampoos), air condition, SAT/TV , access to the Internet (wireless) and a telephone. It occupies the area of 20 m2 + 6 m2 of the balcony. It includes a master bed, bathroom with a shower,(hair drier, towels, shampoos) a fridge, air condition, SAT/TV, access to the Internet (wireless) and a telephone. 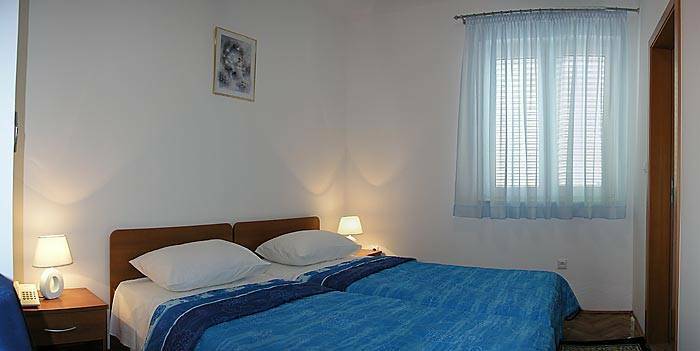 A twin room of 15 m2, bathroom with a shower(hair drier, towels, shampoos), a fridge, air condition, SAT/TV, access to the Internet (wireless) and a telephone. A parking space is reserved for all our guests. The usage of the garage on request. All our guests are free to use an outside barbecue. The historic city nucleus of Trogir with its innumerable cultural monuments (proteceted by UNESCO), restaurants, a disco... is only a few minutes of walk far away from the appartements. 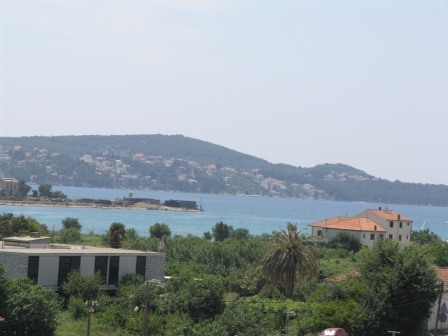 Beaches with numerous sport facilities are 500 to 2000 m far from the appartements. The airport is just 4 km away. There is a possibility of receiving guests for shorter periods. The appartements are available throughout the year. We welcome you to stay with us. Trogir is situated in the center of Dalmatia, southern coast of the Adriatic Sea. The heart of Trogir is a small island situated between the hills of the mainland and the island of Čiovo. It is the small town of 12000 inhabitants and it is the center of micro-region covering 250 km2. The coastline of Trogir comprises 20 islands and districts Seget, Marina and Okrug. Apartments 1 i 4: A4+2 (second floor) They occupy the area of 65 m2 + 12 m2 of the balcony. There are two double-bed rooms, a spacious living room with a kitchen (cooker, fridge, coffee machine) and a sofa for two persons to sleep on, an armchair, a table and chairs, bathroom with toilet (hair drier, towels, shampoos, etc.) air condition, SAT/TV (DVD on request), access to the Internet and a telephone. A1 has a washing machine, too. Apartments 2 i 3: A4+2 (second floor) They occupy the area of 65 m2 + 18 m2 of the balcony. They include one double-bed room, (matrimonial bed), one bedroom with two separate beds, a spacious living room with a large kitchen (cooker, fridge, coffee machine) and a sofa for two persons to sleep on, a table with chairs, bathroom with toilet (hair drier, towels, shampoos, etc.) air condition, SAT/TV (DVD on request), access to the Internet and a telephone. Studio 5: A2+1 (first floor) It occupies the area of 30 m2 + 6 m2 of the balcony. It includes a master bed, a sofa, a table and chairs, a kitchen (fridge, coffee machine), bathroom with a shower, air condition, SAT/TV, access to the Internet and a telephone. Studio 6: A2+1 (first floor) It occupies the area of 25 m2 + 12 m2 of the balcony. It includes a master bed, a sofa , a table with chairs, a kitchen (fridge, coffee machine), bathroom with a shower, air condition, SAT/TV , access to the Internet and a telephone. . 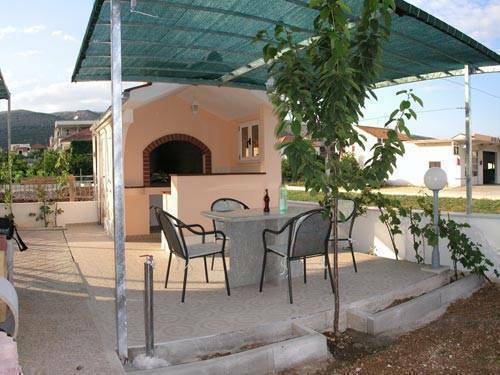 DOUBLE ROOM R8: 2 (first floor) It occupies the area of 20 m2 + 6 m2 of the balcony. It includes a master bed, bathroom with a shower,(hair drier, towels, shampoos) a fridge, air condition, SAT/TV, access to the Internet (wireless) and a telephone. TWIN ROOM R9: 2 (first floor) A twin room of 15 m2, bathroom with a shower(hair drier, towels, shampoos), a fridge, air condition, SAT/TV, access to the Internet (wireless) and a telephone. If cancelled 30 to 15 days before arrival: 30% of total amount charged (valid only for July and August). If cancelled 14 to 7 days before arrival: 30% of total amount charged. If cancelled 6 to 2 days before arrival: 50% of total amount charged. If cancelled less than 2 days before arrival: 100% of total amount to be charged by hotel on credit card. Trogir is connected with many European cities through organized air-services. The airport Split is only 3 km from Trogir, so it takes only few hours to reach this beatiful town. If you fly from Zagreb direction you will have the possibility to choose between more arrival combinations. Therefore ask Your airline about the details (most European airlines have daily connections with Split through summer time).